The Bay Bridge is currently the largest LED lighting sculpture in the world, stretching close to 2 miles wide and 500 feet high. It is so large, in fact, that it even surpasses the world-renowned Eiffel Tower in the number of LED lights. The display is planned to remain alight for a minimum of two years and it has been estimated that in those two years, it will attract more than 50 million viewers from around the world. Due to its world-wide popularity, experts have made a conservative estimate that the display will add $97 million to the local economy. 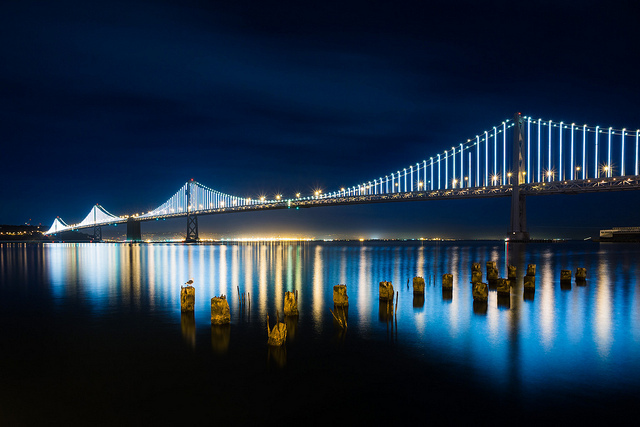 Despite the fact that the lights may be uninstalled in 2015, Villareal states that many people have already grown attached to the lights, claiming to “miss the lights when they’re off.” With the help of private donations, however, there is a great chance that the lights will continue to illuminate the Bay Bridge for future years. If you’re interested in observing the beautiful Bay Bridge LED light display, it shines each night from dusk until 2:00am. If you’re a local commuter, or a tourist eager to see the display, it’s well worth the trip to the Bay.